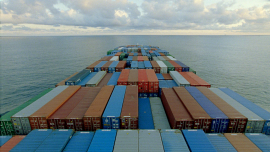 In presenting a number of seemingly disparate small nonfiction pieces back-to-back – with brief intermissions that return to hundreds of multi-colored cargo containers in a suspended travel across the sea – this essay film considers the hefty topic of globalization in perhaps the most logical, albeit frustrating way. Each tangent seems to be the second act of its own documentary – the episodes include a look at the residents Southern California’s “Tent City”, the living arrangements of the students at a Hong Kong Sea School, and the working conditions of a factory in Guangdong. While such a structure provides a context by which the audience can fully interpret the worldly implications contained within the simple innovation of these cargo boxes, the structure is a maddening, exhaustive assault on the senses.